When I hear the word pre-consolidation, I cringe. It is something that I am very familiar with and would do anything to steer clear of. With all of the intense pain that I have experienced in the past few days we were told to go into clinic on Wednesday morning. X-rays were taken over and over and over again until John, another PA who is phenomenal, was satisfied with the views on each leg. Dr. Paley, who was currently preforming surgery in the OR, said that there were no significant findings. His belief was that the pain was the result of all the adjustments being made. Since they did not cut the fibula on the left leg all of the adjustments and lengthening are forcing it to be “pulled downward” tightening the ligaments and thus increasing the pain level. And so I left the hospital in tears, still in an immense amount of pain and not quite convinced that those were the only reasons for my pain. In fact, on the ride home to the hotel I looked at my dad and told him that I knew there was an underlying problem they were not catching. All that I hoped was that preconsolidation had nothing to do with it. That afternoon I went to pool therapy and then to physical therapy feeling much better. Fran, one of the physical therapists, did a wonderful job stretching me out and rubbing my sore muscles. Going back to the hotel I felt much better and they only activities left on my “to do” list were pin care and my last set of turns. After getting all cleaned up, Dad and I came out to visit with some of the families from the hospital whom we have befriended here. Whilst chatting with a girl, Carmen, I decided to do my last turn. In the middle of the adjustment there was a loud pop. Carmen heard it too and it hurt like hell. There were other families with small children around so I did my best not to scream. She asked if I was ok and I immediately shook my head and started crying. My left leg was throbbing even more than before and a few of the pins began to drain. I looked at my dad and told him that we needed to go back to the room. The instant the door closed to the suite bedroom, I lost it. My leg was on fire. Something had happened and the only thing I could think of was the periostium breaking. Immediately I took pain meds and tried to lay down to find some kind of comfort. Once again, I don’t know how she does it, but one of my dearest friends, Elli, called me during my struggle and just when I needed a voice on the other line. For those 10 minutes that we talked on the phone I could be real. She didn’t care that I was crying, swearing or being extremely negative. After talking to her and deciding that yes, this sucked BIG TIME, but I was going to live and we were going to figure things out. She suggest that I let everything I had pent up inside out. So I told dad to go and finish the laundry upstairs, that I would be ok. As soon as the door closed behind him I stuck my face in my pillow and started to scream and cry as loud and as hard as I could. I threw a tantrum until I had nothing left and thus, in the most awkward position possible I fell asleep. Just that small amount of sleep made me feel better. 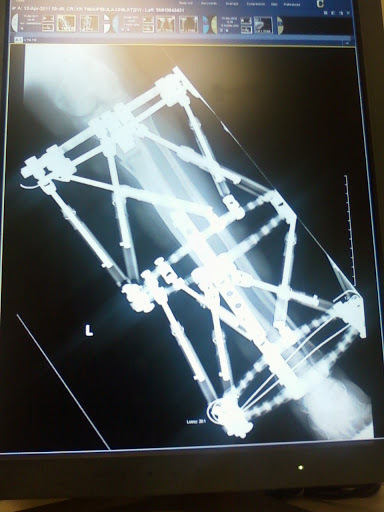 An x-ray of my left leg, when, at the time no complications were visible. Look closely by the knee and ankle and you can see where the bone is actually broken.